The proteases market is projected to reach USD 2.21 Billion in terms of value by 2021, at a CAGR of 6% from 2016 to 2021. The objectives of the study is to define, segment, and measure the global market with respect to sources, applications, methods of production, formulation, products, and key regional markets. They also include major factors influencing the growth of the market, strategically analyze the micromarkets, analyze opportunities for stakeholders, provide details of competitive landscape, and strategically profile the key players with respect to their market share and core competencies. This report includes estimations of market sizes for value (USD billion). Both top-down and bottom-up approaches have been used to estimate and validate the size of the proteases market and to estimate the size of various other dependent submarkets in the overall market. Key players in the market have been identified through secondary research, and their market share in respective regions has been determined through primary and secondary research. All percentage shares, splits, and breakdowns have been determined using secondary sources and were verified through primary sources. The various contributors involved in the value chain of proteases include proteases manufacturers such as Novozymes A/S (Denmark), Chr. Hansen Holdings A/S (Denmark), E.I. du Pont de Nemours and Company (U.S.), Associated British Foods plc (U.K.), Koninklijke DSM N.V. (The Netherlands), government bodies & regulatory associations (United States Department of Agriculture (USDA), Food and Agriculture Organization (FAO), Association of Manufacturers & Formulators (AMFEP), Enzyme Technical Associations (ETA) and Environmental Protection Agency (EPA)), distributors such as AB Enzymes (Germany) and Novozymes A/S (Denmark), end users such as the food & beverages, livestock feed, soaps & detergent, pharmaceuticals, and other industries such as textile & leather, waste management, chemical industries, silver recovery, photography, and biofuel. The market for proteases is projected to reach ~USD 2.21 Billion by 2021, at a CAGR of 6% from 2016 to 2021. 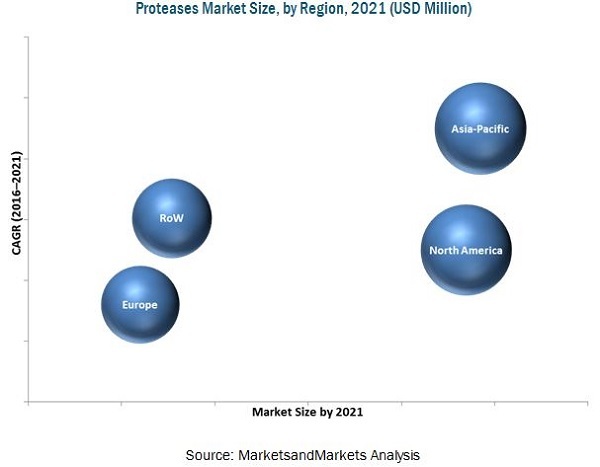 The proteases market is fueled by growing industrialization, increasing incidence of diseases, growing environmental concern, and focus on cost reduction and resource optimization, which has led to a large-scale adoption of proteases for various applications. The market is segmented on the basis of source into animal, plant, and microbial. The microbial segment is growing at the fastest rate in terms of value, due to the increasing producers’ demand as it is commercially viable & helps in yield improvement, and inability of plant and animal sources to meet the proteases demand globally. Based on applications, the market is segmented into food & beverages, livestock feed, soaps & detergent, pharmaceuticals, and other applications. Soaps & detergents dominated the proteases market as proteases is cost-effective and safe to use. The changing cleaning habits, development of technology such as protein engineering to produce high performing products, and growing environmental concern are driving the market for proteases use in the soaps and detergents industry. Based on the methods of production, the market is segmented into fermentation and extraction. Fermentation dominated the proteases market due to producer’s reliance on microbial sources and economic efficiency involved as the process is time and cost saving. The market is also segmented on the basis of formulations into liquid, lyophilized powder, and others. Lyophilized powder dominated the global market in terms of formulation due to its functional properties as it increases the shelf life of the product and also due to the development & advancement of technology such as encapsulation. On the basis of products, renin dominated the animal product segment for proteases owing to its physiological benefits and its major use in the food & beverages industry such as cheese making. Papain dominated the plant product segment of proteases due to its health benefits such as boosting digestion, supporting the immune system, acting as an antioxidant, and others, along with its functional properties such as relatively heat-resistant enzyme makes it more preferable. Alkaline is the largest microbial product in the proteases market owing to its functional properties as it is more stable at high temperatures and it also finds its application majorly in the soaps and detergent industry which is the largest industry for enzyme application. On the basis of region, the market is segmented into North America, Europe, Asia-Pacific, and the Rest of the World (RoW). North America dominated the global market due to the developed industries in this region. Asia-Pacific is the fastest growing region in the proteases market due to continuous increase in demand for proteases owing to the economic and operational benefits from proteases along with increasing industrialization, ease of doing business, and broad application spectrum. Increasing raw material cost, lack of transparency in patent protection, and stringent government regulations laws along with price war among different proteases manufacturers are restraining the market. The proteases market is fragmented and competitive, with a large number of players operating at regional and local levels. The key players in the market adopted expansions and investments as their preferred growth strategy. Key players such as Chr. Hansen Holdings A/S (Denmark), E.I. du Pont de Nemours and Company (U.S.), Associated British Foods plc (U.K.), Koninklijke DSM N.V. (The Netherlands), Novozymes A/S (Denmark), Dyadic International Incorporated (U.S.), Advanced Enzyme Technologies Ltd. (India), Biocatalysts Limited (U.K.), Amano Enzyme Inc. (Japan), and Specialty Enzymes and Biotechnologies (U.S.). have been profiled in the report. 14.7 Advanced Enzyme Technologies Ltd.